So like we did previously with our studies of the career paths of English majors and History majors, we took it upon ourselves to find out what do most math majors go on to do with their careers. Math majors learn many skills that are valued across industries. These include quantitative, computational and analytical skills. The rigor of a math major is highly respected by many companies. In fact, when you search for “Mathematics Degree” on this site, you will first see math specific academic jobs. As you scroll further, you begin to see the range of jobs that are open to math majors. Technology, data and analytics, engineering, product management, marketing many more. In a 2009 study done on job satisfaction levels, Mathematician, Actuary and Statistician were ranked #1, #2 and #3, respectively. If you are trying to figure out your college major, or are a recent graduate with a degree in Math, it’s not always clear how to shape your career. 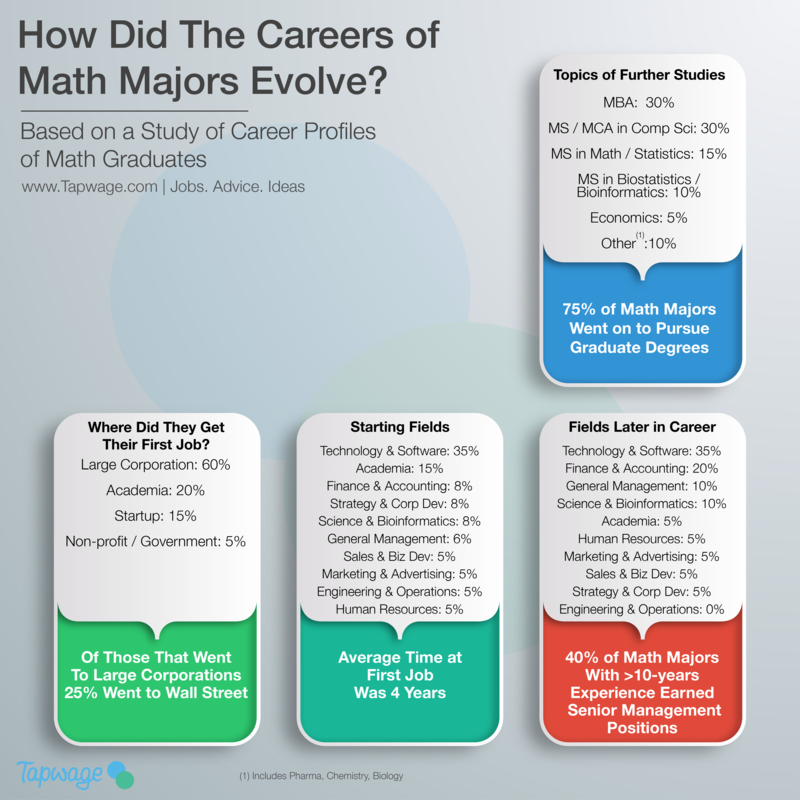 In this study we look back at what actual math majors did in their career, the jobs they chose and how their careers evolved over a 20-year period. Math majors had a high propensity to pursue further studies as 75% of our sample set chose this route. Math is the basis for many key applications like finance, computer science, and bioinformatics. Unsurprisingly, many math majors pursued further studies in those areas. This often kick started their career in those fields. The two most popular areas of further studies were a MBA, and a Masters in IT / Computer science. 30% of the professionals who opted for further studies chose to pursue these degrees. 15% went on to complete statistics or math master’s degree, many of whom pursued a PhD as well and chose academic careers. 10% selected bioinformatics or biostatistics, which often set them up for a career in pharma or in research labs. The remainder chose areas like economics, chemistry, biology and pharma. Candidates usually opted for further studies immediately after graduating with the exception of MBAs. MBAs typically got a few years of work experience before pursuing their degree. About 30% of candidates who pursued further studies also went on to do a PhD. When math majors entered the workforce, either immediately after graduating or after their further studies, they usually opted for large corporations. PhDs and those with a Masters in Math or Bioinformatics usually to started out in academia or at a research institute. Only a handful went to non-profit or government jobs. Of those that went to large corporations, 25% went to a large Wall Street bank. About half of those went into front-office investment banking, trading or investment management careers. The other half worked in strategy, marketing, sales and other roles. A handful chose to start their careers at big consulting firms as well. The most popular field was software engineering and IT. This was a popular straight out of college, as well as for those that pursued a master’s degree in computer science. Science and bioinformatics was a popular career for those who pursued advanced degrees in those areas. We saw professionals find their way into pretty much every type of corporate career including sales, marketing, human resources, and operations. In general, professionals stayed in their first job for about 4-years. Due the nature of the advanced degrees being in specific areas like technology, finance, and bioinformatics, we saw fewer career transitions for math majors. We did see subtle shifts and more senior roles. The most popular career transition was out of academia. People who started in research jobs in academia tended to move into industry during the course of their career. Only a handful of academics stuck to that career path throughout. The ones that did tended to get tenure and became senior professors. Later, they took on leadership roles at the universities they worked at. The rest of the career transitions were subtler. Professionals tended to move into general management roles. We also saw professionals move into senior finance roles like CFO over the course of their careers. Around 40% of professionals with over 10-years of work experience found themselves in senior management role at the companies they worked for. Entrepreneurship was a prevalent theme as well. Around 15% of graduates decided to join a smaller, private company or a startup after they graduated. Only one person in our study started his or her own company immediately after graduating. Around 15% of the professionals pursued entrepreneurship at some point in their career. This survey captured a wide spectrum of potential careers in the corporate world and again proved that choosing a major is often a stepping stone to a career but the world is still your oyster. Given the popularity of the MBA degree among math majors, we think more recent graduates might increasingly also opt for data and analytics jobs at corporates or startups, and those with advanced degrees would increasingly opt for data science jobs, a title that has only really come into vogue in recent years. Moreover, marketing science and market research jobs that tend to specifically seek candidates with math / statistics degrees was a career we didn’t see represented in the survey but that we would increasingly expect math majors to consider given the skill set. In an age of immense computational power, and big data — those words hold more true than ever. This survey captured a wide spectrum of potential careers in the corporate world. This again proved that choosing a major is often a stepping-stone to a career, but the world is still your oyster. Given the popularity of the MBA degree, we think that more recent graduates may opt for data and analytics jobs at corporates or startups. Those with advanced degrees would likely opt for data science jobs. This is a title that has come into vogue in recent years. Marketing science and market research jobs tend to seek candidates with math / statistics degrees. This was a career we didn’t see represented in the survey, but would expect math majors to consider given their skill set. Recent studies have shown that many students with great grades in math in high school often don’t opt to major in math in college. Our evaluation of career paths reveals that they should. Their is a wide range of career options available to them post graduation. The astronomer Galileo Galilei once said, “If I were again beginning my studies, I would follow the advice of Plato and start with mathematics”. In an age of immense computational power, and big data, those words hold truer than ever. The purpose of this study is to give our readers career ideas and inspiration. You can use these averages to guide you, but your career should reflect your interests, and personal objectives. We have linked fields and titles to curated channels. You can click through to get a sense of the real jobs and requirements underlying each field. If you have questions as you look to navigate your career, write in at info@tapwage.com. We would love to hear from you.